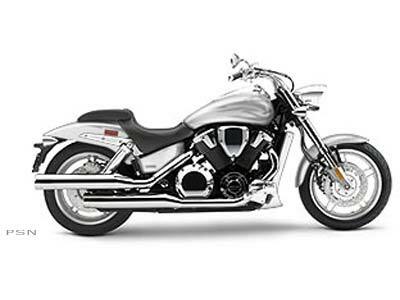 Performance Drag-Style Custom FenderThe VTX1800F features bobbed front and straight-cut rear steel fenders, completing the drag-racing sport custom styling. Cast Aluminum WheelsShow-stopping, 10-spoke cast aluminum wheels, available in satin-brushed or high-polish finishes, create an aggressive, racer-like look. Flangeless Fuel TankThe flangeless fuel tank, with 4.8 gal. capacity, has seamless eye-catching street-rod style and an extensive cruising range. Tank Decal Badging The flangeless fuel tank features pinstripe-quality VTX decal badging for a smooth side finish. Dragster-Style SeatingLow, 27.9 in., 2-piece gunfighter-style seat features a removable passenger section for the ultimate custom look and feel. Straight-Cut 5-Bolt Muffler Tips ExhaustThe staggered dual exhausts and straight-cut 5-bolt muffler tips cleanly accentuate the custom tail end. New-Style MirrorsThe VTX1800F features wedge-shaped mirrors for a tapered, designer look. Bullet-Style HeadlightThe streamlined headlight design, with a distinct, smaller-hooded lens, creates a uniquely minimalist look. Bullet-Style Turn SignalsWith chrome visors, clear lenses and amber flasher bulbs, the bullet-style turn signals complement the VTX1800F's custom image. Tank-Mounted SpeedometerUnique to the VTX1800F, the tank-mounted speedometer features a high-tech, race-style bar-graph tachometer, LCD instrumentation and distinct, style-specific display background. Custom Handlebars and RisersThe semi-swept, high-rise aluminum handlebar mounts are mated with straight, dragbike handlebars, providing street-rod styling without compromising riding comfort. Billet-Style Fender RailsBillet-style rear fender rails feature slotted surface design for a unique feel. Flush-Mounted LED TaillightsUnique and distinctive, the back end of the VTX1800F stands out with recessed LED tail- and brake lights.